What do you give a person who is called names, attacked for his ideas, and branded a heretic? If the person is Stanley Prusiner you give him a Nobel Prize. 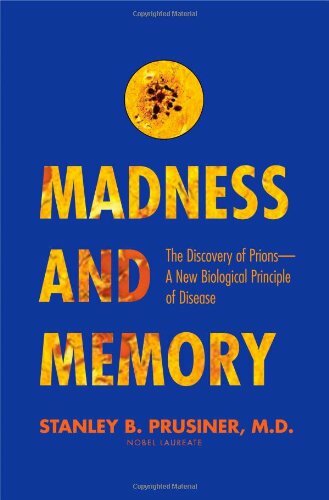 Prusiner was awarded the 1997 Nobel Prize in Physiology or Medicine for his research leading to the discovery of prions, proteins that are responsible for a number of neurodegenerative diseases. Prusiner started his scientific career in his undergraduate studies at the University of Pennsylvania, where he also attended medical school. There he began to develop an interest in research that stayed with him the rest of his life. One challenge that confronted Prusiner in his research was the prevailing theory that these disorders were caused by viruses, which were composed mainly of nucleic acids. He had to overcome strong prejudice and opposition to his ideas that these causative agents were not viruses (there were no nucleic acids present) and that they were proteins (no neurodegenerative pathogenic agent at that time had been shown to be a protein). Over the course of his research, he was roundly attacked for his “heretical” beliefs. Even after he was awarded his Nobel Prize, scientists still mocked him and denied his results. The initial research was difficult to carry out because there was no simple and fast way to identify the presence of the infectious material. The assay methods involved grinding up tissues from an infected animal and injecting it into an uninfected one. Then the behavior of the injected animal was monitored until signs of nervous system problems were seen, often many months after the initial injection. Large numbers of animals were required, so progress was extremely slow and the project was very expensive to carry out. Once the protein was identified and could be isolated, results came much more rapidly. A major conceptual issue was the idea that the protein involved did not have a modified chemical composition when infective, but rather a simple change of shape. The idea of as protein shifting its shape was not new. The hemoglobin molecule in red blood cells (responsible for the transport of oxygen in the bloodstream) will shift its shape when oxygen molecules attach to it. When the red cell reaches a tissue needing oxygen, the oxygen molecules go off the hemoglobin and into the tissue cell. As the oxygen molecules leave the hemoglobin, the protein shape shifts back. Other examples of protein changes of shape involve allosteric enzymes. A molecule will loosely attach to the enzyme, changing its three-dimensional shape and affecting the activity of that enzyme. This research project also demonstrates the often high cost of doing science. As the study developed, yearly budgets of a million dollars or more were involved. In this case, one can see the ultimate value of the project in hindsight because of the value of understanding disorders such as Alzheimer’s disease. Concerns about expensive research are often raised in areas where the payoff is not nearly as obvious. Prusiner’s description of how the grant process works is informative to those outside the field, as is his concerns about tenure and the ability to continue his studies. Parts of the book may seem overwhelming to the non-scientist (and perhaps even to some scientists who do not work in the life sciences arena). Throughout the chapters are detailed descriptions of experimental protocols explaining some particular problem and how the research team solved the challenge presented to them. One purpose of including this detailed information may be to illustrate how a scientific problem is approached and the strategies needed to deal with the difficulties. Prusiner does not give us the idealistic, sanitized picture of modern scientific research where cooperation and collaboration are commonplace. Rather, the author shows science today as it really is: competitive, crowded with too many people trying to get funding, involving sometimes massive egos at play instead of the search for truth, and rife with naysayers’ refusal to accept new ideas in spite of the data. Prusiner shows the science game as it is too often played today, and we are all better for his sharing.